Probably not a food that makes it on to your dinner table with any amount of frequency. Once you read this I hope that changes. Beets really are an incredible food. Which is why health-food companies manufacture hundreds of new products with beets in them yearly. And while beets are a great food to eat, let me start this article off with a warning. If you prepare beets at home, make sure you’ve got a really good hand soap. Otherwise it may look like you’ve committed murder when the reddish color of the beet stains your hands. Of course that red color, the same way that’ll stain your hands like a red ink, is the conduit of many of the nutrients that have known abilities to increase various aspects of your health. Today I’m going to show you just how effective beets are at improving your health. While beets are commonly thought of as being a deep, ruby red, beets come in a few other colors, including white, golden, pink and even striped. 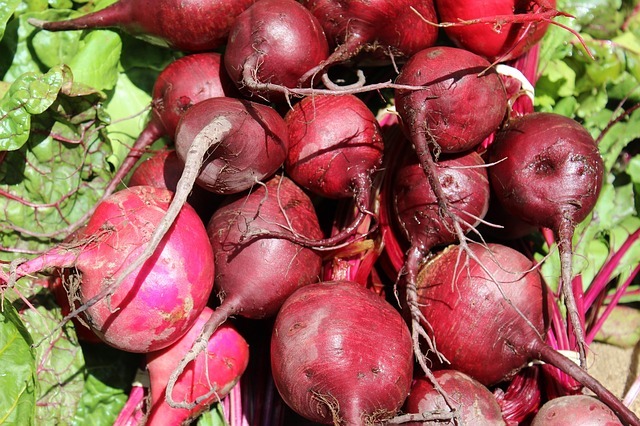 No matter the color, beets are rich in a number of phytonutrients. And may of these phytonutrients are what give your body the ability to self-regulate and fight disease. While inflammation in and of itself isn’t bad, chronic inflammation may have some adverse effects on your health. Beets contains a number of antioxidants which help to lessen chronic inflammation and can improve your health. The antioxidants present in beets include betanin, vulgaxanthin, betaine, vitamin C, manganese as well as lutein and zeaxanthin (lutein and zeaxanthin are present in the green, leafy part of the beet, and not in the root). In some case, these antioxidants lessen inflammation by inhibiting the activity of cyclo-oxygenase enzymes (including both COX-1 and COX-2). By inhibiting their function, COX enzymes cannot produce messaging molecules that are the cause for inflammation. If your body’s COX enzymes are constantly “on” then the antioxidant activity of the beet help to lessen the amount of inflammation in the body. One of the main antioxidants present in beets is called betaine. Betaine is made from a combination of B-complex vitamin and choline. By itself, choline is essential for cardiovascular health as it helps to regulate inflammation by keeping homocysteine from building up in the body. Studies indicate elevated levels of homocysteine are strongly linked to heart disease as they produce chronic inflammation and create extra pressure on your body’s arteries. When choline helps to form betaine, the protetice benefits are indisputable. Studies indicate betaine’s presence in the body lowers levels of important inflammatory markers, (these include C reactive protein, interleukin-6, and tumor necrosis factor alpha). Beets also contain naturally occuring nitrates, which when metabolized turn into nitric oxide. Nitric oxide helps to increase blood flow in the body by dilating your blood vessels and causing your blood pressure to drop. Decreasing your blood pressure with nitric oxide helps to take stress off of your heart which keeps it healthy and functioning properly. Eating beets and increasing nitric oxide in the body isn’t just great for your heart health, it also helps to restore sexual function as well. Nitric Oxide increases the amount of blood that makes it to sexual organs during arousal. Several well-known pharmaceuticals rely on this property to help individuals enjoy better sexual health. This isn’t to say that beets will cure dysfunction in this particular area of health. There are no studies involving beets and how they’ll treat various health conditions related to sexual health. However, knowing how beets are helpful at improving heart health, and understanding that heart health is inextricably linked to sexual function, this has led many nutritionists and natural health practitioners to encourage people to add beets to their diet. To maintain peak health, it’s incredibly important your body’s natural detoxification processes are functioning at 100%. The World’s Healthiest Foods has written a succinct recap on how beets give your body’s detox systems. “The betalin pigments present in beets have repeatedly been shown to support activity in our body’s Phase 2 detoxification process. Phase 2 is the metabolic step that our cells use to hook activated, unwanted toxic substances up with small nutrient groups. This “hook up” process effectively neutralizes the toxins and makes them sufficiently water-soluble for excretion in the urine. One critical “hook up” process during Phase 2 involves an enzyme family called the glutathione-S-transferase family (GSTs). GSTs hook toxins up with glutathione for neutralization and excretion from the body. The betalains found in beet have been shown to trigger GST activity, and to aid in the elimination of toxins that require glutathione for excretion. The increased blood flow and antioxidant activity of beets various phytonutrients helps to improve brain health. A 2010 study of elderly individuals indicated adding beets into a diet helps to increase blood flow to certain areas of the brain that are typically the sites where dementia and Alzheimer’s disease begin to set in. The researchers noted that by drinking blood flow to the white matter of the frontal lobes increased. Another vitamin present in beet root is folic acid. Folic acid is essential for brain health, and research in animals has shown adding beetroot to your diet may help to protect the brain from atrophy and damage. “In an animal study, mice with Alzheimer’s-like plaques in their brains were fed a diet that included a normal amount of folic acid. Those fed the folic acid diet had more brain cells in the hippocampus compared to their folic acid-deficient counterparts. While beets are a tremendous addition to your diet, don’t make the mistake of preparing them incorrectly. While some foods need to be cooked for a long time to activate their nutrients, beets aren’t like that. The betalains in beets are susceptible to extended exposure to heat. This is why you should only steam them for 15 minutes and if roasting, keep the time in the oven under 60 minutes. Other than that, you can feel free to enjoy beets any way you choose. I’d recommend trying to get them into your diet 2-3 times a week as a way to.